✓ Up to 70 programmable radio channels. ✓ Noise Cancelling Waterproof Speech Microphone (IP68). 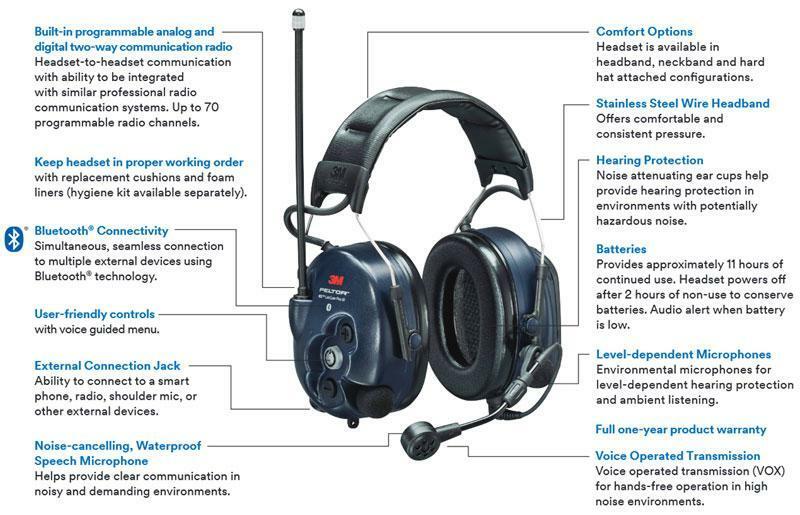 Radio solutions stock the all new 3M Peltor Headset, with cutting edge features such as Bluetooth® wireless communication, environmental listening and level dependent hearing protection, offering next generation of protective communication. Engineered with the working professional in mind, the 3M™ PELTOR™ WS™ LiteCom Pro III headset is designed to be comfortable for everyday use and extended wearability, with simple functions as not to distract from your daily work routine. The 3M™ PELTOR™ WS™ LiteCom Pro III Headset can withstand some of the harshest environments being resistant to temperature fluctuations, rain, and wind. Peltor 3M have designed a world class next generation protective communication headset that can be programmed to use depending on your existing two-way radio system to either analog or digital UHF two-way radio transmission, and can be programmed to unique radio frequency channels as needed. · Hearing Protection for environments with potentially hazardous noise. · Up to 70 programmable radio channels. · Bluetooth® Multipoint Connectivity, for simultaneous, seamless connection. · Bluetooth® Streaming Wireless Technology A2DP profile support. · Noise Cancelling Waterproof Speech Microphone (IP68). · Push-to-Listen quick activation of Level Dependent Function. · Stainless Steel Wire Headband offers comfortable pressure during prolonged usage.